Photo Backup - For years now, my standard approach has been to use a Micro SD card (plus adapter) in my DSLR. In the past, I could pop this card directly into my cell phone to access photos. The Note 5 doesn't have a Micro SD slot, but for a few dollars I was able to pick up the tiny Leef Access Micro SD adapter on Amazon. 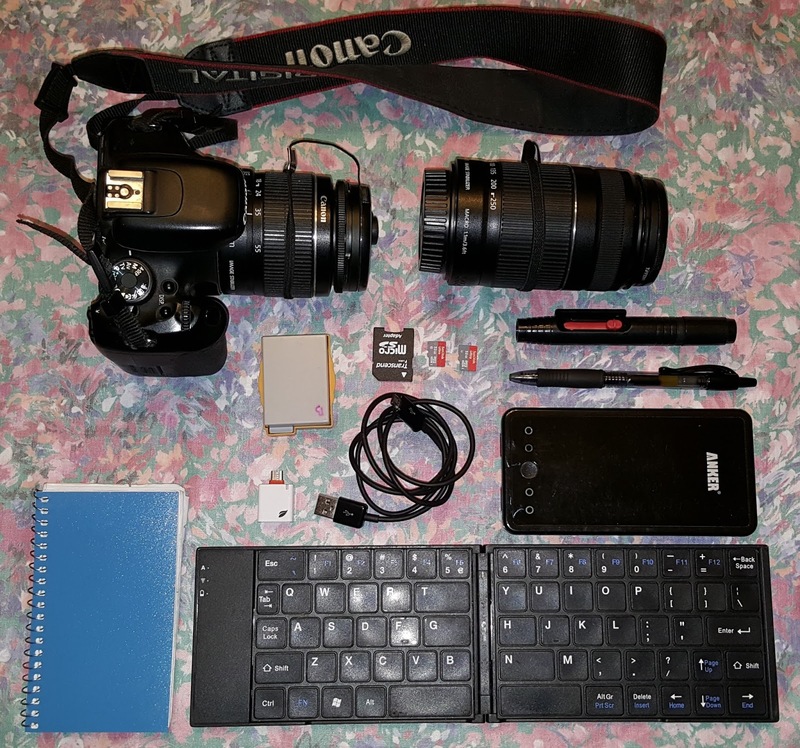 I plug the adapter into my phone, and then insert the SD card, and voila!, my cell phone can access the DSLR photos. And here's where I got clever: every night I'd copy the DSLR photos to my cell phone, and my cell phone photos over to my DSLR card. That way, I had a backup of both types of photos, one on an SD card and on on my phone. I also made sure Google Photo Backup was running, and nightly all the photos from my phone (which included both DSLR and cell phone) were pushed to Google over the hotel's WiFi. I experimented with using FolderSync to push files to Google Drive. That works well enough, but pushing the full size images over our first hotel's WiFi was just a non-starter. Instead, Google's Backup did the job just fine (I'm currently backing up high quality not original photos, which are smaller in size). Photo Review - Every couple of nights we'd open up gallery app FStop, and browse through the photos we'd shot. One especially nice feature of FStop is the ability to tag photos. As we browsed through the hundreds of photos we took, we'd tag a handful of them as blog and they'd get used in blog preview posts described below. Blogging - Previously, when we traveled I'd use my laptop mainly as a way to write up blog Posts. While the Note 5 offers this capability, it's not the ideal platform to edit and finalize photos (the screen is big, but not *that* big). So this trip I compromised. Nightly, I'd write up my notes about the day in spiral notepad. And then every few days I'd bust out my Bluetooth Keyboard and compose the text for a post. I like to write up travel posts as close to the event as possible, as it's easy to forget details. For now, I've saved up those posts as .html files and will post them once we've fully edited our photos. Still, I can't resist posting *something* while on vacation, so every few days we put up a Preview Post. I used FStop's tagging feature to pick a number of photos to post, and then shared those photos with the Bloggeroid app. Work - I usually carry a laptop to help out if any server or software issues come up. Luckily, this trip, none did (at least nothing that a few e-mails wouldn't help with). But had something come up, I've got ssh and a Bluetooth keyboard that's saved the day enough times I'm confident in it as a solution. Staying Found - The winner this trip for helping us not get lost was the GPS Plus Test App (specifically the paid version). 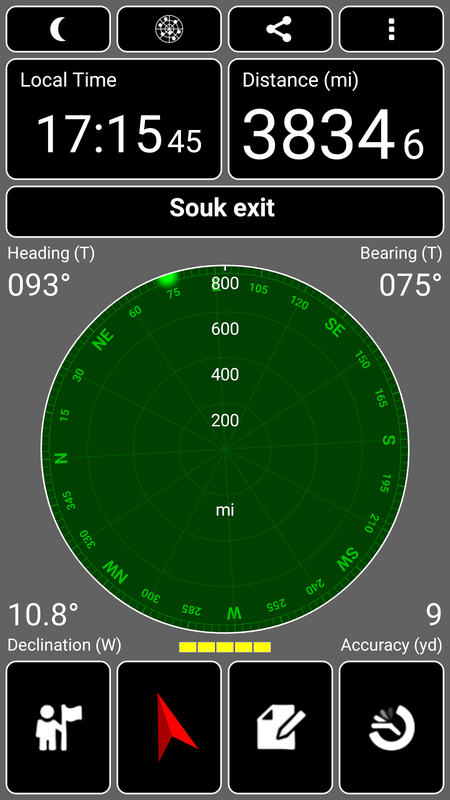 This oddly named app allows you to drop a waypoint and quickly see your relation to it. 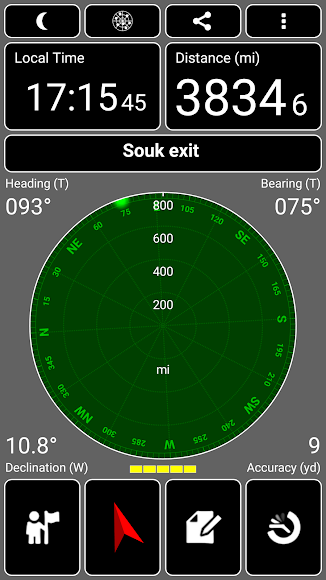 We'd drop waypoints as we traversed the various souks and never had to worry about getting too lost. Capturing Audio - Depending on where I'm at, I often like to try to capture quick audio snippets. I've yet to find a use for these, but I have this hope one day that I'll put them together into a presentable form. In the past I'd used soundcloud.com, as it makes it very easy to record and publish your audio recordings. But I'd exceeded my paid subscription and couldn't justify paying even more per month for what accounts to a file storage service. So I installed Titanium Recorder, which seems to do an adequate job for capturing audio. I'll then store these files on Google Drive for posterity. I installed Lame in GNUroot, so converting the .wav files to .mp3 while on the go is possible. Though I never did get around to trying this in the field. Staying Connected - Here's a Moroccan specific tip: purchasing a SIM Card is cheap and relatively easy. The tricky part is that only an official cell phone store (like an Inwi or Moroc Telecom) can issue you a SIM card. Like all phone transactions (yes, I'm looking at you T-mobile stores), it seems to take absolutely forever to complete the transaction (OK, like 20 minutes). But for around $3.00, your cell phone becomes functional in the country. I also purchased a data plan, which at the time it didn't occur to me to push back on. The clerk setup me up with a $10, 12 Gig plan, but that was way overkill. I should have been able to get a gig or two for a few dollars. Cell phone service is actually quite impressive in Morocco. As we climbed up and down the barren passes in the mountains, our guide made cell phone calls to coordinate both our lunch and pickup. We're lucky if we have T-mobile service 45 minutes of out town, so to 4G service in the sticks is impressive. When it was all said and done, the $13 investment gave me Google Maps, the ability to check and respond to e-mail on long car drives and a cell phone number. Definitely worth it. Staying Entertained - I used the usual apps to stay entertained on the plane. This includes Overdrive to listen to books and Gnuroot + emacs + reddit to do a bit of coding. Nothing new or exciting here. It's really not surprising that we were able to go the week without a laptop. Our main goal was to enjoy being on vacation, and all you need for that is the urge to explore and a healthy sense of humor.